Malaysia is the world's third-largest exporter of liquefied natural gas, the second-largest oil and natural gas producer in Southeast Asia, and strategically located amid important routes for seaborne energy trade. Malaysia's energy industry is a critical sector of growth for the entire economy and has accounted for nearly 20% of the country's total gross domestic product in recent years.1 New tax and investment incentives, which started in 2010, promote oil and natural gas exploration and development in the country's deepwater and marginal fields, energy efficiency measures, and use of alternative energy sources. These fiscal incentives are part of the country's economic transformation program to leverage its resources and geographic location to become one of Asia's top energy players by 2020.2 Another key pillar in Malaysia's energy strategy is to become a regional oil and natural gas storage, trading, and development hub that will attract technical expertise and downstream services that can compete within Asia. Malaysia, located within Southeast Asia, has two distinct parts. 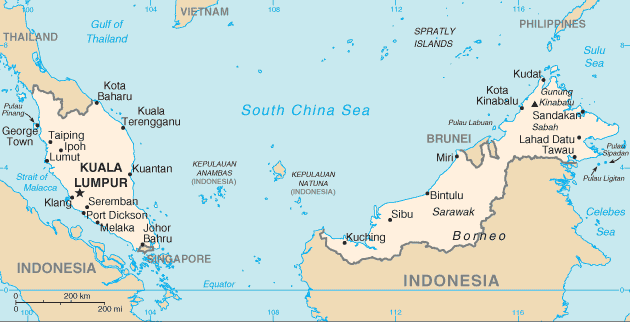 The western half contains the Peninsular Malaysia, and the eastern half includes the states of Sarawak and Sabah, which share the island of Borneo with Indonesia and Brunei. The country's western coast runs along the Strait of Malacca, an important route for the seaborne trade that links the Indian and Pacific Oceans. Malaysia's position in the South China Sea makes it a party to various disputes among neighboring countries over competing claims to the sea's oil and natural gas resources. Although it has bilaterally resolved competing claims with Vietnam, Brunei, and Thailand, an area of the Celebes basin remains in dispute with Indonesia. Potential territorial disputes with China, Vietnam, and the Philippines could emerge as the country's exploration initiatives move into the deepwater areas of the South China Sea. Several major upstream and downstream oil and natural gas projects have been commissioned in Malaysia during the past few years as part of the country's strategy to enhance output from existing oil and natural gas fields. The incumbent and long-ruling Barisan Nasional party (BN), which won the May 2013 general election, is slated to remain in power until the next election scheduled for 2018. The BN party has a track record of promoting hydrocarbon investment, and it intends to continue boosting oil and natural gas production, reforming the energy sector to attract more investment, providing fiscal incentives to expand the use of Malaysia's renewable energy, and developing the country's energy infrastructure. Significantly lower oil and natural gas prices since the latter half of 2014 have negatively affected Malaysia's export revenues and hydrocarbon investment. However, in an effort to lower its fiscal deficit, the country has reduced its energy subsidies to end users and raised economic consumption taxes in the past few years.3 Malaysia aims to diversify its fuel slate and move further downstream to become an oil and natural gas trading hub. As Malaysia targets economic development and increased manufacturing, the country is focused on securing energy through cost-effective means and diversifying its fuel supply portfolio. Petroleum and other liquids and natural gas are the primary energy sources consumed in Malaysia, with estimated shares of 37% and 43%, respectively, in 2014. About 17% of the country's energy consumption is met by coal. Hydropower contributes 1%, and renewable energy contributes 2% to total consumption (Figure 2).4 Malaysia's heavy reliance on oil and natural gas to sustain its economic growth led the government to emphasize fuel diversification through investments in renewable energy, particularly biomass, solid waste, and solar. The power sector's recent investment in more coal-fired power could raise the share of coal consumption in the next few years. Malaysia is the second-largest producer of petroleum and other liquids in Southeast Asia, following Indonesia. Nearly all of Malaysia's oil comes from offshore fields. According to the Oil & Gas Journal (OGJ), Malaysia held proved oil reserves of 3.6 billion barrels as of January 2017, the fourth-highest reserves in Asia-Pacific after China, India, and Vietnam (Figure 3).5 Nearly all of Malaysia's oil comes from offshore fields. The continental shelf is divided into three producing basins: the Malay basin, offshore peninsular Malaysia in the western area, and the Sarawak and Sabah basins in the eastern region. About 40% of the country's oil reserves are located in the Malay basin and tend to be light and medium sweet crude oil grades from shallow waters, although in the past decade, more exploration and discovery of reserves have taken place in deepwater areas in eastern Malaysia.6 Malaysia's prize benchmark crude oil fields include Tapis, (located offshore Peninsular Malaysia) and Miri, Kikeh, and Kimanis (located near Borneo Island in the eastern region). Malaysia's domestic oil consumption has risen while production has fallen in most years since 2003, leaving smaller volumes of oil available for exports. Petronas is working to attract new investments and to reverse production declines by enhancing output from existing fields through advanced EOR techniques and developing small, marginal fields through risk-service contracts (RSCs). Companies share the risk in these contracts: Petronas is the project owner and investors are the service providers receiving revenues for oil produced throughout the entire life of the project. Malaysia are cooperating with neighboring countries bordering the South China Sea (SCS) to exploit the area's significant hydrocarbon potential. The country holds estimated reserves of 5 billion barrels of crude oil and liquids and 80 trillion cubic feet of natural gas in the SCS, the largest of any of the border countries (see South China Sea Analysis Brief). In May 2009, Malaysia submitted SCS territorial claims to the United Nations Commission on the Limits of the Continental Shelf. Malaysia currently disputes China's territorial claims through its nine-dash line, a series of lines encompassing most of the South China Sea based on China's historical territorial claims. Malaysia has not filed a legal case against China and has preferred to advance bilateral relations between the two countries. Malaysia has a relatively limited oil pipeline network and relies on tankers and trucks to distribute products onshore. Malaysia's main oil pipelines connect oil fields offshore Peninsular Malaysia to onshore storage and terminal facilities. The Tapis pipeline runs from the Tapis oil field and terminates at the Kerteh plant in Terengganu, as does the Jerneh condensate pipeline. The oil pipeline network for Sabah connects offshore oil fields with the onshore Labuan oil terminal. This network is currently expanding following the recent launch of development projects including the Kebabangan cluster, the Malikai, Gumusut/Kakap, and Kikeh oil fields. A few other oil pipelines connect offshore fields with the onshore Bintulu oil terminal in Sarawak. An international oil-products pipeline runs from the Dumai oil refinery in Indonesia to the Melaka oil refinery in Melaka City, Malaysia. An interconnecting oil-products pipeline runs from the Melaka refinery via Shell's Port Dickson refinery to the Klang Valley airport and to the Klang oil distribution center. Malaysia exported an eight-year high of 333,000 b/d of crude oil in 2016. Almost all of Malaysia's crude oil exports are shipped within Asia Pacific, the bulk of which were sent to Australia, India, Thailand, Singapore, and Indonesia.37 Japan purchased more crude oil from Malaysia to use for power generation following the loss of nuclear electric generation after the country's Fukushima accident in 2011, although these export volumes have now returned to pre-Fukushima levels. The country's imports of petroleum products have grown faster than its exports in the past few years because of weaker oil demand in other parts of Asia. Much of Malaysia's oil product trade occurs within Asia, especially with neighboring Singapore. Gasoline is the key import product, making up about 46% of petroleum product imports and about 20% of all oil product demand. Malaysia exports about half of its diesel production.38 Malaysia's oil demand slowed in 2015 and 2016 as a result of weaker economic growth and competition with other fuels such as natural gas and coal. As part of Malaysia's goal to compete with the oil refining and storage hub in Singapore, Petronas plans to build a refining and petrochemicals integrated development project (RAPID) in Johor, located at the southern tip of Peninsular Malaysia. This project includes a 300,000 b/d refinery that the industry expects will turn Malaysia from a net oil product importer to a net oil product exporter once it is operational. The project has incurred several delays, although Petronas made a final investment decision in 2014. The company began project construction soon after. In early 2017, Saudi Arabia's major oil company, Saudi Aramco, purchased a 50%-stake in the refinery for $7 billion, which will help Petronas bring the refinery online in 2019. As part of the deal, Saudi Aramco is slated to supply up to 70% of the crude oil required by the facility.40 The RAPID facility will be the country's first refinery to process diesel and gasoline that meet the Euro V standard, which lowers emission levels. Sources: FACTS Global Energy, Petronas, Reuters. Malaysia was the world's third-largest exporter of liquefied natural gas (LNG) after Qatar and Australia in 2016. The country's growing domestic demand and regional gas imbalances in the past few years prompted the country to open its first regasification terminal as another supply source. Similar to the oil sector, Malaysia's state-owned Petronas dominates the natural gas sector. The company has a monopoly on all upstream natural gas developments, and it also plays a leading role in downstream activities and the liquefied natural gas trade. Most natural gas production comes from PSAs operated by foreign companies in conjunction with Petronas. Shell remains the largest gas producer and a key player in the development of deepwater fields in Malaysia.50 Other international companies that have sizeable upstream investments in Malaysia's natural gas fields include Murphy Oil, ConocoPhillips, Nippon Oil, INPEX, and Mitsubishi. Rising domestic energy demand, particularly in Peninsular Malaysia, and LNG export contract obligations are placing pressure on the country's gas supply and driving Malaysia to actively seek investments for reservoir development. Several ongoing projects will expand natural gas production in Malaysia over the near term. Exploration and development activities in Malaysia continue to focus on offshore Sarawak and Sabah. Over the long term, Malaysia needs to attract higher levels of investment and technical capabilities to develop deepwater fields and those containing high levels of carbon dioxide and sulfur. One of the most active and prolific areas for natural gas exploration and production is the Malaysia-Thailand Joint Development Area (MTJDA), located in the lower part of the Gulf of Thailand and the northern part of the Malay Basin. The area is divided into three blocks, A-18, B-17, and C-19, and is administered by the Malaysia-Thailand Joint Authority (MTJA), with each country owning 50% of the MTJDA's hydrocarbon resources. According to the MTJA, 27 natural gas fields were designated by 2014, including nine fields each in Block A-18, Blocks B-17 and C-19. Production at Block A-18 started in 2005 and has a contracted level of about 290 billion cubic feet per year (Bcf/y) of processed natural gas. Block B-17 and Block C-19 came online by 2010. From 2010 to 2026, Blocks B-17 and C-19 are contracted to deliver 120 Bcf/y for the first 10 years then 90 Bcf/y for the remaining 6 years. Overall, average natural gas production from MTJDA was slightly higher than 400 Bcf/y in 2015 and 2016.55 Block B-17-01 is expecting development of its gas fields in 2017, with first gas deliveries in 2018.56 MTJA continues to explore the area to discover more hydrocarbons. Malaysia has one of the most extensive natural gas pipeline networks in Asia, totaling about 1,530 miles. The Peninsular Gas Utilization (PGU) project, completed in 1998, expanded the natural gas transmission infrastructure on Peninsular Malaysia. The PGU system spans 1,550 miles and has the capacity to transport 730 Bcf/y of natural gas.69 Other gas pipelines run from offshore gas fields to gas processing facilities at Kertih. A number of pipelines link Sarawak's offshore gas fields to the Bintulu LNG facility. However, limited gas distribution coverage exists in much of the Sarawak and Sabah states. The Sabah-Sarawak Integrated Oil and Gas Project, installed in 2014, includes the 318-mile onshore Sabah-Sarawak Gas Pipeline (SSGP) and can transport about 365 Bcf/y of gas from Sabah's offshore fields to the Petronas LNG complex in Bintulu for liquefaction and export. Some natural gas from the terminal is also reserved for fueling downstream industrial projects and for power generation in Sabah.70 Other pipelines link natural gas fields located offshore Sabah to the Labuan Gas Terminal. The Association of South East Asian Nations (ASEAN) is promoting the development of a Trans-ASEAN Gas Pipeline system (TAGP) aimed at linking ASEAN's major gas production and consumption centers by 2020 through a network of gas pipelines. Because of Malaysia's extensive natural gas infrastructure and its location, the country is a natural candidate to serve as a hub in the ongoing TAGP project, which currently has 2,250 miles in place of the proposed 2,800 miles of pipelines.71 Malaysia began exporting natural gas to Singapore through a pipeline in 2000. Singapore currently has two contracts to import 84 Bcf/y of gas from Malaysia, but its imports dropped to 44 Bcf in 2015 because Singapore imports natural gas through its new LNG terminal. Natural gas pipelines between West Natuna, Indonesia and Duyong, Malaysia were installed in 2002, and Malaysia began importing natural gas from Indonesia in 2009. In 2015, Malaysia imported around 90 Bcf of natural gas from Indonesia.72 The Trans-Thailand-Malaysia Gas Pipeline was commissioned in 2005 and allows Malaysia to transport natural gas from the Malaysia-Thailand JDA to its domestic pipeline system. Malaysia remains a key global LNG exporter as the third-largest exporter after Qatar and Australia in 2016 (Figure 7). Malaysia is developing sizeable reserves in its eastern region and has expanded its export capacity in 2017. However, growing natural gas supply shortages in demand centers in Peninsular Malaysia have prompted Petronas to construct the country's first LNG import terminal in this western region to augment natural gas supply from pipelines. The Malaysia LNG (MLNG) complex located at Bintulu in the state of Sarawak is the main hub for Malaysia's natural gas industry and is operated by Petronas. Petronas owns majority interests in the facility's three LNG processing plants (Dua, Tiga, and Satu), which are supplied by the country's offshore natural gas fields. MLNG is one of the largest LNG complexes in the world, with nine production trains and a total liquefaction capacity of 1.4 Tcf/y. Petronas began operating the facility's ninth train in January 2017. Japanese financing has been critical to the development of Malaysia's LNG facilities. The complex at Bintulu also hosts Shell's gas-to-liquid (GTL) project, which currently has a capacity of 15,000 b/d of petroleum liquids. Petronas commissioned the ninth train of Bintulu LNG at the beginning of 2017. Petronas proposed two floating liquefaction terminals offshore Sarawak and Sabah to capture greater economic value from the country's smaller, more remote gas fields. These plants would have the flexibility to serve the export or domestic markets and are transportable to other locations. Both terminals will add another 131 Bcf/y of liquefaction capacity. The Petronas floating LNG (FLNG) Satu project, located off Sarawak near the Petronas LNG complex, has a capacity of 58 Bcf/y and is contracted to use natural gas from the Kanowit field for at least five years. Petronas FLNG Satu, which is the world's first floating liquefaction terminal, commenced commercial operations in early 2017. Petronas plans to market some of the natural gas from the facility to the domestic market, but it has not signed any purchase contracts so far. PFLNG-2, the country's second proposed offshore LNG terminal, intends to monetize natural gas production from the Rotan field and other fields in Block H, northeast of Sabah in the South China Sea. The terminal has a design capacity of 73 Bcf/y, but it is uncertain whether the facility will serve domestic demand in Peninsular Malaysia or serve as exports to other Asian markets. Petronas made a final investment decision on the project in early 2014. However, the low price environment and Petronas' subsequent announcement to reduce capital expenditures in the near term has caused the NOC to delay commencement of Petronas FLNG-2 by two years to 2020. (Table 2). In 2016, Malaysia shipped about 1.2 Tcf/y of LNG and accounted for 10% of LNG exports worldwide.73 Key importers of Malaysia's LNG are Japan (62%), South Korea (16%), China (11%), and Taiwan (10%) (Figure 8). Most of Malaysia's LNG is sold through medium- or long-term supply contracts with traders or utilities in these countries. Malaysia also has sold LNG cargoes to Petronas LNG Limited, a trading company based in Malaysia, which ships spot LNG cargoes to many locations around the world. 1A train is an independent unit for liquefaction and purification. 2A floating terminal is a unit above an offshore gas field that produces, liquefies, stores, and transfers natural gas. Although Malaysia is one of the world's largest LNG exporters, the country currently experiences a geographic disparity between natural gas supply and demand. The Western Peninsular Malaysia demands more natural gas to fuel the power and industrial sectors, while the eastern states of Sarawak and Sabah, located on Borneo Island, produce natural gas. To meet gas needs in Peninsular Malaysia, Petronas is developing regasification terminals to secure supply from the global gas market. Malaysia's first regasification terminal, Lekas LNG, began operating in 2013. Lekas LNG is located near Malacca and has a capacity of 184 Bcf/y. Malaysia imports about 70 Bcf of LNG annually, and ships only small amounts from its own production at the MLNG liquefaction terminal.80 Petronas and Dialogue Group agreed to develop a terminal in Johor, Pengerang LNG. The regasification terminal, which is linked to the NOC's RAPID project, is slated to provide natural gas feedstock to the refining and petrochemical complex and to a proposed power plant at the site. Pengerang LNG is under construction and scheduled to come online by 2018. Several other regasification projects have been proposed in the past few years, but some were cancelled (Table 3).81 Gradual natural gas price prices and competition with coal and oil for power supply have slowed natural gas demand and the progress of other proposed terminals in the past few years. Malaysia's electricity demand, met mostly by natural gas and, to a lesser extent, coal, continues to expand rapidly. This growth coupled with insufficient natural gas supply in high-demand centers is driving the country to diversify its power generation fuel mix and to add electricity capacity to avoid future power shortages. Malaysia's economic development and population growth have resulted in substantially higher electricity demand over the past decade. The country's net electricity generation was about 140 billion kilowatthours in 2015 (Figure 9).85 The Malaysian states anticipate that electricity demand will grow by an average of 3% and more than 5% each year in Peninsular Malaysia and eastern Malaysia, respectively, through 2020.86 The high-demand centers, particularly in Peninsular Malaysia, are facing shortages of natural gas and a need for greater generation capacity. Sarawak and Sabah in Borneo require more energy to meet the demands of their growing infrastructure and industrial sectors. Malaysia is seeking to diversify its portfolio of power generation fuels and to reduce the use of more expensive fuels. Total installed generation capacity at the end of 2014 was more than 30 gigawatts (GW), located mostly in Peninsular Malaysia.94 The government's efforts are centered on meeting the country's rising electricity demand through a more balanced portfolio of electric generation using coal, renewable sources, and to a lesser extent, natural gas. Malaysia's policy to reduce power consumption also entails reforming electricity prices to be more reflective of market values and promoting energy-efficiency measures. Although petroleum products currently account for a very small portion of the capacity and generation and have been replaced by natural gas and coal inputs, they have played a critical role as an alternative fuel in the past few years to alleviate power shortages when other fuels were in short supply. Diesel and fuel oil accounted for 1% of Malaysia's electricity generation in 2015 and were used mostly in generators in remote areas of Sabah state.100 Most of these oil-fired plants are old, and Sabah is gradually replacing diesel generators and other oil-fired capacity with plants that use natural gas or renewable energy as a feedstock. Hydroelectricity, which accounted for 15% of Malaysia's total electric capacity and 11% of electricity generation in 2015, is undergoing significant expansion.106 Most of the hydroelectric facilities are small or medium sized and are located in Peninsular Malaysia. However, the Sarawak state has the most potential for hydroelectric growth considering its rainfall and geography. Data presented in the text are the most recent available as of April 26, 2017. 1Prime Minister Department of Malaysia, Performance Management and Delivery Unit, Economic Transformation Program, Oil Gas and Energy (accessed March 2017); Economic Transformation Program, A Roadmap for Malaysia, Chapter 6, Oil gas and energy, page 168; Malaysia Development Investment Authority, Oil and Gas (accessed March 2017). 3bid, International Monetary Fund, "IMF Staff Completes 2017 Article IV Mission to Malaysia", December 14, 2016; IMF "Press Release: IMF Executive Board Concludes 2016 Article IV Consultation with Malaysia", May 4, 2016. 4International Energy Agency, Statistics, Malaysia: Balances for 2014 (accessed March 2017). 6Energy Commission of Malaysia, Malaysia Energy Information Hub, Statistics (accessed March 2017). 7Petronas, "Petronas Group Financial Results Announcement Q4 and Year end FY 2016", page 9; Bank Negara Malaysia, "Economic and Financial Data for Malaysia" (accessed March 2017). 8Petronas, "Sustainability Report 2015", pages 18-19. 9IHS Energy, LNG Market Profile: Malaysia, November 2016, page 15. 10Nikkei Asian Review, "Pertamina buys Malaysian assets to meet domestic demand", April 9, 2015; The Jakarta Post, "Pertamina acquires Murphy's Malaysian assets for $2 billion", October 2, 2014. 15FACTS Global Energy, Asia Pacific Databook 1: Supply, Demand, and Prices, Spring 2016, pages 105-106. 16Hart Energy, "Malaysia Plans $61 Billion E&P Push" January 17, 2013; Newsbase, AsianOil, "Oil prices continue to hold Malaysian projects back", March 15, 2017, page 8 and "Petronas seeks outside investment", March 8, 2017, page 7. 17IHS Energy, "Malaysia Licensing Activity Review 2015", November 28, 2016. 18Economic Transformation Program, "Rejuvenating Existing Fields through Enhanced Oil Recovery (EOR)" (Accessed March 2017); FACTS Global Energy Asia-Pacific Databook 1: Supply, Demand, and Prices, Spring 2016, page 106; and Oil & Gas Journal, "ExxonMobil to boost Tapis field production in Malaysia" June 10, 2010. 19Shell, "Petronas and Shell Sign Production Sharing Contracts for Enhanced Oil Recovery", January 16, 2012. 20The Star, "Shell, Petronas expand Baram Delta terms to include gas rights" July 3, 2014. 21Newsbase, AsianOil, "Hibiscus to buy into Malaysian EOR project", October 19, 2016, page 10. 22Newsbase, AsianOil, "Oil prices continue to hold Malaysian projects back", March 15, 2017, page 9. 23The Star Online, "Petronas achieves first oil production from Tanjong Baram field" January 6, 2016. 24Rigzone, "First Oil Flows from Kapal, Banang, Merantai Cluster off Peninsula Malaysia" January 13, 2014. 25The Star Online, "End of the road for risk-services contracts (RSCs)" July 12, 2016. 26Newsbase, AsianOil, "Octanex NL on tract to commence oil production in Malaysia", January 18, 2017, page 16. 27Murphy Oil Corporation website, Malaysia (accessed March 2017); Oil and Gas Journal, "Oil production starts from Kikeh field off Malaysia" August 22, 2007; IHS Energy, "Malaysia crude oil production", January 4, 2017; Newsbase, AsianOil, "Murphy wraps up Malaysian field shutdown", November 9, 2016, page 11. 29The Star, "MISC buys back 50% equity in Gumusut-Kakap for RM 1.9bil", February 24, 2016. 30Rigzone, "Shell Sees Malikai Project in Malaysia as Boosting Deepwater Ambitions" June 14, 2016; Newsbase AsianOil, "Shell starts up Malikai deepwater project", December 21, 2016, page 10; Shell Global, "Shell starts oil production from Malikai deep-water platform in Malaysia", December 14, 2016 and Our Major Projects: Malikai (accessed March 2017). 31Platts, "Malaysia, Brunei sign series of oil, gas agreements" December 9, 2013; IHS Energy, Liquefaction Project Profile: Brunei LNG, October 28, 2016, page 23. 32UN-Nippon Foundation, "Maritime delimitation between Vietnam and her neighboring countries" April 2009. 33Offshore Technology, Projects, PM-3 Commercial Arrangement Area (accessed March 2017); Repsol, Annual Report, Repsol in 2015, Malaysia (accessed March 2017); VnExpress, "PetroVietnam, Petronas extend joint upstream oil and gas project to 2027", May 10, 2016. 34Rigzone, "Petronas, PetroVietnam Extend PM3CAA PSC in Malaysia-Vietnam Waters to 2027", May 10, 2016. 35Rigzone, "Shell & Petronas Carigali Awarded Two Ultra-Deepwater Blocks", February 16, 2005; World Politics Review, "Naval Standoff Between Indonesia, Malaysia", June 12, 2009. 38FACTS Global Energy, Asia Pacific Databook 1: Supply, Demand, and Prices (pages 47-51) and Databook 3: Oil Product Balances (pages 34-36), Fall 2016. 39FACTS Global Energy, Asia Pacific Databook 2: Refinery Configuration & Construction, Spring 2017, page 34. 40Petronas, "Saudi Aramco, Petronas Sign Share Purchase Agreement for Equity Participation in Malaysia's RAPID Downstream Project", February 28, 2017; Reuters, "Saudi Aramco to buy $7 billion stake in Petronas' RAPID refinery project", February 28, 2017. 41International Energy Agency, Oil Market Report 2017, page 126. 42VTTI, Terminals, ATB, Johor, Malaysia (Accessed March 2017); S&P Global Platts, "VTTI to complete Phase 2 of Malaysia's ATT Tanjung Bin oil terminal in Q1 2015", August 15, 2013. 43Vopak, "Pengerang Independent Terminals" (Accessed March 2017); Dialog, "Pengerang Deepwater Terminal" (Accessed March 2017); International Energy Agency, Oil Market Report 2017, page 126; Reuters, "Update 1-Vopak to start crude oil storage site in Malaysia in March", February 3, 2015. 45Reuters, "Malaysia to boost oil storage business as new terminal starts on Saturday" April 11, 2014 and Newsbase AsianOil April 16, 2014. 46International Energy Agency, Oil Market Report 2017, page 126; Maritime Herald, "Malaysia started building of Kuala Linggi International Port in Malacca worth 2.8 billion USD", November 24, 2016. 47International Energy Agency, Oil Market Report 2017, page 126; Reuters, "Malaysia delays Sabah oil terminal start 3mths-sources" February 11, 2014. 48Oil &Gas Journal, "Worldwide Look At Reserves and Production" December 5, 2016, page 22. 49Energy Commission of Malaysia, Malaysia Energy Information Hub, Statistics, Natural Gas - Reserve (accessed March 2017). 50IHS Energy, "LNG Export Sustainability Series: Malaysia", July 16, 2014; Shell, Annual Report 2016, page 38. 51IHS Energy, LNG Market Profile: Malaysia, November 2016, pages 15-16, LNG Data Sheet: Malaysia, March 1, 2017; Business News, "Gas tariff hike in the offing", March 28, 2016; New Straits Times, "No change in the power tariffs", June 30, 2016; Malaysian Gas Association, Malaysia: Natural Gas Industry Annual Review 2016 Edition, pages 42-43. 52The Star, "Natural gas tariffs to fall for Jan-June 2017", December 28, 2016. 53Malaysia Energy Information Hub, National Energy Balance 2014, page 42. Aggregated Power stations and Cogeneration, and Industry and Non-energy. 54FACTS Global Energy, East of Suez Gas Databook: Asia Pacific in the Global Market, September 2016, pages 167-168; IHS Energy, "LNG Import Outlook: Malaysia", July 14, 2016, page 5. 55IHS Energy, "MTJDA gas production", January 4, 2017. 56Malaysia-Thailand Joint Authority (MTJA), Petroleum Potential and Exploration, Development (accessed March 2017). 57Borneo Post, "Shell Malaysia signs new exploration contract with Petronas", November 28, 2012. 58IHS Energy, Liquefaction Project Profile: MLNG T9, October, 2016, pages 4 and 16. 59The Star, "Kasawari project outlook seen improving", February 23, 2017; Newsbase, AsianOil, "Petronas seeks outside investment", March 8, 2017. 60Offshore Technology, "Kumang Cluster Development Phase 1, Sarawak, Malaysia" (accessed April 2017). 61Platts, "Explorer Newfield says makes 'significant' gas find offshore Sarawak" April 3, 2013. 62SapuraKencana, "Energy Development Assets" (Accessed April 2017). 63SapuraKencana Energy, "SapuraKencana Energy makes significant gas discovery offshore Malaysia", May 31, 2016. 64IHS Energy, Liquefaction Project Profile: PFLNG 2, November 2016, page 17. 65IHS Energy, Liquefaction Project Profile: MLNG Dua, October 2016, page 11; Offshore Energy Today, Gas Flows from Kebabangan (Malaysia), November 12, 2014; Conoco Phillips, "2016 Annual Report", page 17. 66Offshore Technology, "Kebabangan Gas Field, Malaysia" (accessed March 2017). 67The Edge Markets, "Uzma takes up Kinabalu gas development project where THHE Fabricators left off", January 18, 2017. 68Offshore Technology, "PFLNG - 2 / Rotan FLNG Project, Sabah, Malaysia", (accessed March 2017); IHS Energy, Liquefaction Project Profile, PFLNG 2, November 2016, page 4. 69Petronas, "Peninsular Gas Utilization Project"
70IHS Energy, LNG Export Sustainability Series: Malaysia, July 16, 2014, page 4; Daily Express, "Exciting year for oil & gas industry" January 5, 2015. 71ASEAN Council on Petroleum, Project, Trans ASEAN Gas Pipeline Project, (accessed April 2017); ASEAN, Trans-ASEAN Gas Pipeline, Securing Long Term Energy Supply for the Region, October 2015; Master Plan on ASEAN Connectivity, April 2014, pages 17-18; International Energy Agency, Medium-Term Natural Gas Market Report, 2014: pg. 184. 72IHS Energy, LNG Data Sheet: Malaysia, March 1, 2017. 73IHS Energy, Global LNG Trade Data, January 10, 2017. 75ibid and The Star Online, "Petronas sells 10pc in Bintulu LNG plant to JX Nippon Oil" June 3, 2016. 76Reuters, "Petronas to export world's first LNG from floating production unit: data, sources", March 30, 2017; Offshore Energy Today, "Petronas' first FLNG unit produces LNG", December 9, 2016; IHS Energy, Liquefaction Database, February 16, 2017. 77IHS Energy, Liquefaction Project Profile: PFLNG Satu, December 2016, page 5. 78LNG World News, "Malaysia's Petronas delays its second FLNG project" February 29, 2016; IHS Energy, Liquefaction Project Profile: PFLNG 2, November 2016, pages 4 and 30. 79Capacity data and dates from IEA's Medium-Term Gas Market Report 2016, IHS Energy regasification database (February 2017), IHS liquefaction database (February 2017), and International Gas Union, World Gas LNG Report 2016. 80IHS Energy, Historical LNG Trade Data, March 14, 2017. 81IHS Energy, "LNG Import Outlook: Malaysia", July 14, 2016; LNG World News, "Petronas, Sabah Energy scrap Malaysian LNG project" February 10, 2016; The Star, "Ranhill tipped for another IPP, a 300 MW power plant in Sabah" September 5, 2016. 82IHS Energy, LNG Market Profile: Malaysia, November 2016, page 10. 83The Star, "Dialog units sign accord on Pengerang LNG project" November 15, 2014 and "Dialog Group seeks nod to raise RM2.65b for Pengerang expansion" March 19, 2015. 84LNG World News, "Samsung C&T awarded LNG terminal contract in Johor" November 24, 2014. 85EIA, International Energy Statistics (accessed April 2017); Malaysia's Energy Commission, Malaysia Energy Statistics Handbook 2016, page 33. 86Malaysia's Energy Commission, Peninsular Malaysia Electricity Supply Industry Outlook 2016, page 30; Malaysia's Energy Commission, Sabah Electricity Supply Industry Outlook 2015, pages 26, 30; Sarawak Energy, Annual Report 2015, page 30. 87Malaysia's Energy Commission, National Energy Balance 2014, page 58, 59. 88Malaysia's Energy Commission, 2014 Performance and Statistical Information on Electricity Supply Industry in Malaysia, page 107. 90The Star, "Sarawak exporting electricity to West Kalimantan" May 11, 2016; Borneo Post, "Electricity to be exported to Kalimantan by year-end", March 19, 2015. 91IHS Energy, LNG Market Profile, Malaysia, November 2016, page 16; and IHS Energy, "Malaysian electricity prices to rise 15% in 2014 on back of fuel subsidy cut", December 4, 2013. 92Tenaga Nasional, Tariff and ICPT (accessed April 2017); Malaymailonline, "Energy Minister: No change to 2016 power tariffs, but peninsula users to get smaller rebate" December 8, 2015. 93New Straits Times, "No change in power tariff rates" June 30, 2016. 94EIA International Energy Statistics; Malaysia's Energy Commission, 2014 Performance and Statistical Information on Electricity Supply Industry in Malaysia, page 107. 95EIA International Energy Statistics; Malaysia's Energy Commission, Malaysia Energy Statistics Handbook 2016, page 33; Malaysia's Energy Commission, 2014 Performance and Statistical Information on Electricity Supply Industry in Malaysia, page 107. 96FACTS Global Energy, East of Suez Gas Databook: Asia Pacific in the Global Market, September 2016. 97The Sun Daily, "Commercial operation date of TNB's Prai power plant delayed: MARC" January 19, 2016. 98Petronas, "Yayasan Sabah's joint venture power plant begins full operations" November 9, 2014; Malaysia's Energy Commission, Sabah Electricity Supply Industry Outlook 2015, pages 14, 31. 99The Borneo Post, "Sarawak Energy partners with GE, Sinohydro on CCGT devt in Tg Kidurong" October 29, 2016. 100Malaysia's Energy Commission, Malaysia Energy Statistics Handbook 2016, page 33. 101The Sun Daily, "Malakoff's Tanjung Bin energy Power Plant achieves COD" March 22, 2016; The Star, "RM6bil Manjung 4 power plant to be switched on this sunday" April 10, 2015. 102TNB, "Construction of Jimah East Power Commences" July 25, 2016; TNB Annual Report 2016, page 38. 103IHS Energy, Malaysia Coal Profile, January 2017, pages 4 and 7; Malaysia's Energy Commission, Malaysia Energy Information Hub, Coal Statistics. 104Sarawak Energy, Generating Energy for Sarawak, (accessed April 2017). 105United Nations Comtrade, International Trade Center, (accessed April 2017). 106U.S. EIA International Energy Statistics; Malaysia's Energy Commission, Malaysia Energy Statistics Handbook 2016, page 33; Malaysia's Energy Commission, 2014 Performance and Statistical Information on Electricity Supply Industry in Malaysia, page 107. 107Regional Economic Development Authority (RECODA), Sarawak Corridor of Renewable Energy, "Why SCORE". 108Ibid; Borneo Post, "80 percent hydro power by 2020" October 17, 2012. 109Borneo Post, "The future of hydropower in Sarawak" June 9, 2013. 110The Borneo Post, "Another accomplishment for Sarawak" September 28, 2016. 111The Star, "Sarawak Energy gets go-ahead to build Baleh dam", September 21, 2016; Borneo Post, "Sarawak's Power Play" February 23, 2014. 112Prime Minister Department of Malaysia, Economic Planning Unit, Eleventh Malaysia Plan 2016-2020, Chapter 6, page 6-11; United Nations Framework Convention on Climate Change, "Intended Nationally Determined Contribution of the Government of Malaysia", page 1. 113 Malaysia's Energy Commission, Peninsular Malaysia Electricity Supply Industry Outlook 2016, page 34; Tenaga Nasional, Annual Report 2016, page 53.